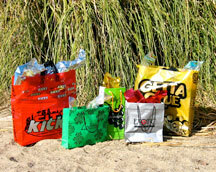 “Unlimited possibilities” describes the budget-friendly custom printed poly bags Luna offers. With excellent domestic mills and a twenty year collaboration with an outstanding mill in Hong Kong, Julie can help you custom design a poly bag program that will ideally fit your needs. We can make any size of bag, in any gauge (thickness of plastic), with many choices of handles. Our print capabilities are amazing – we can print anything from simple graphics to complicated 4- color process designs. And we can put recycled content and oxo biodegradable additive in your poly bags so they’re more eco-friendly!